As indicated last week and yesterday, Apple today launched updated MacBook Airs, which feature faster versions of Intel's Haswell processors at $100 less for each model. All standard models of the 11-inch and 13-inch MacBook Air now come with a faster 1.4 GHz dual-core Intel Core i5 processor along with the same 4GB of RAM. 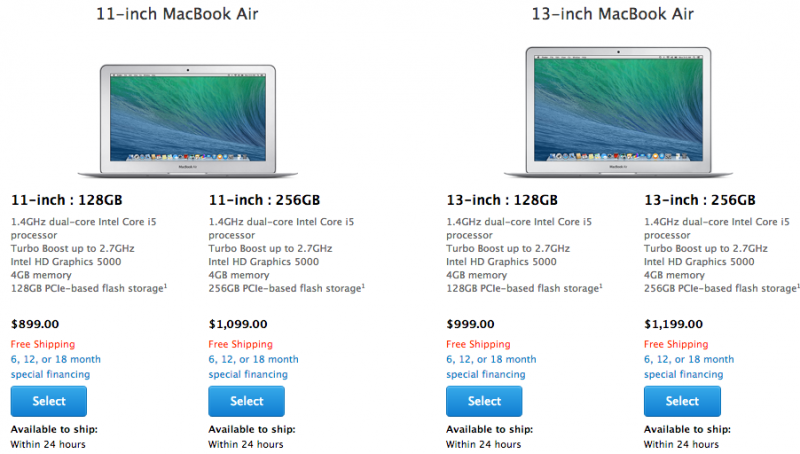 Both entry-level configurations of the 11-inch and 13-inch models now sell for $899 and $999 with 128GB of flash storage, while the higher-end 11-inch and 13-inch models now come in at $1099 and $1199 with 256GB of flash storage, respectively. Build-to-order options include a 1.7 GHz dual-core Intel Core i7 processor with up to 8GB of RAM on both the 11-inch and 13-inch MacBook Airs. Apple is also rumored to be working on a 12-inch MacBook with a new ultra-slim design and a high resolution Retina display for later this year. The updated 11-inch and 13-inch MacBook Airs are available today through Apple's various retail locations and online store, with all standard configurations showing availability of "within 24 hours." Update 1:28 AM: Apple's updated MacBook Airs are now available in its U.S. Online Store with each model now costing $100 less compared to the previous model. Update 1:36 AM: Notably, the battery specs for both new models list slightly longer iTunes Movie playback times, with the 11-inch model jumping from 8 to 9 hours of playback and the 13-inch model jumping from 10 to 12 hours. Update 6:08 AM: Apple has issued a press release announcing the minor update. The press release also highlights the significant increase in battery life for movie playback through iTunes. Update 9:00 AM: Refurbished MacBook Air computers have dropped to all time low prices, with an 11-inch 2012 model available starting at $599. 2013 models are available starting at $719. Apple's updated MacBook Airs are now available in its U.S. Online Store with each model now costing $100 compared to the previous model. Well isn't that just the most fantastic deal ever. Hopefully the price drop is indicative of a major lineup refresh! Take that $100 price drop and put it into 8 GB of RAM. You may not really need it now, but that day when you do and you can't upgrade it, ouch. I could probably get by on 128 GB of storage since I don't think I would plan on this being my primary computer. But I could always attach a TB external drive. I can't attach external RAM. Alas, since I'm broke and can't really justify a new notebook with a Windows one that's working fine for the $250 it set me back, this is just eye candy. I also don't want to buy when I know retina models are in the pipe in the near future. Where the **** is the new Mini? Excited does not even begin to cover it! My first Mac.... I'm migrating from PC. It's good news with bad to an extent. On the one hand, it's great for those that want a Haswell MBA with 128GB (base model) at £100 less than it was a couple days ago. For those that were hoping for a rMBA any time soon, it seems the wait goes on. The updated MacBook Air will not launch until 2015. I don't know where these 2014 rumours come from. They are 100% wrong.